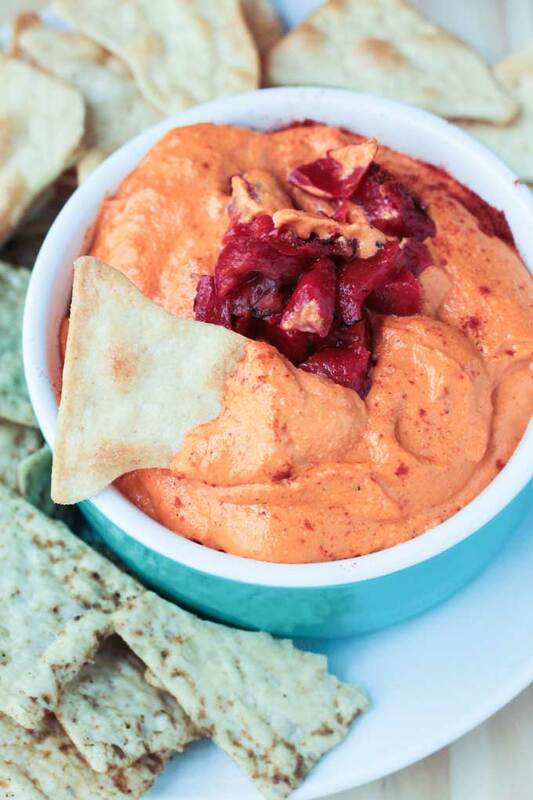 Cashew Dip w/ Roasted Red Peppers – A little smoky, a lot creamy, and super easy to make. Grab your favorite crackers, chips or raw veggies and get your snack on! 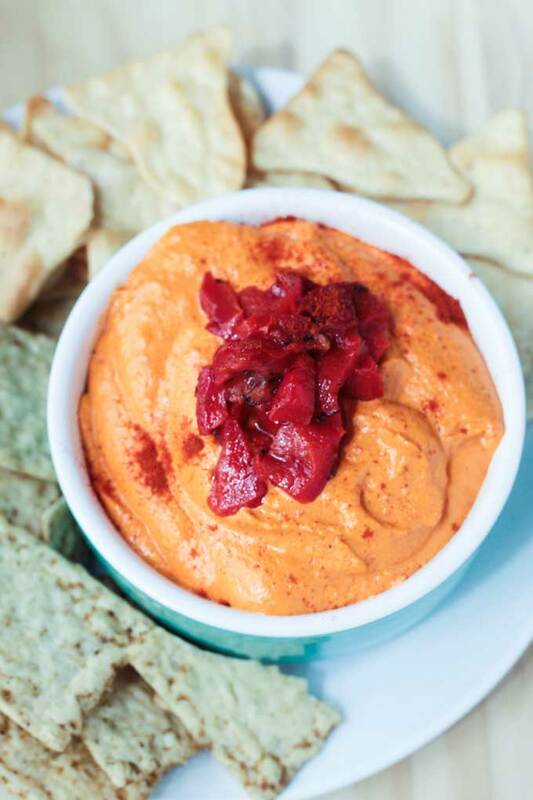 I’ve made this Smoky Roasted Red Pepper Cashew Dip three times this week. The first time, I just threw some ingredients together because I wanted a dip for my tortilla chip addiction. I was originally going for a smoky nacho cheese like dip. I didn’t exactly get that, but what I did get was so darn good that I couldn’t stop eating it (and therefore why I made it three different times!) I love smoky flavors and smells – the smell of a bonfire, the hint of tobacco in a dry red wine, the burnt sugar topping on a creme brûlée….swoon! If you like smoky flavors too, you are going to LOVE this! I use cashews as a base for a lot of my dips, dressings and spreads and that’s because they are so super creamy when soaked and pureed. My Sun Dried Tomato Spread is one of my current favorites and my Vegan French Onion Dip is a staple chip dip for any time of year. 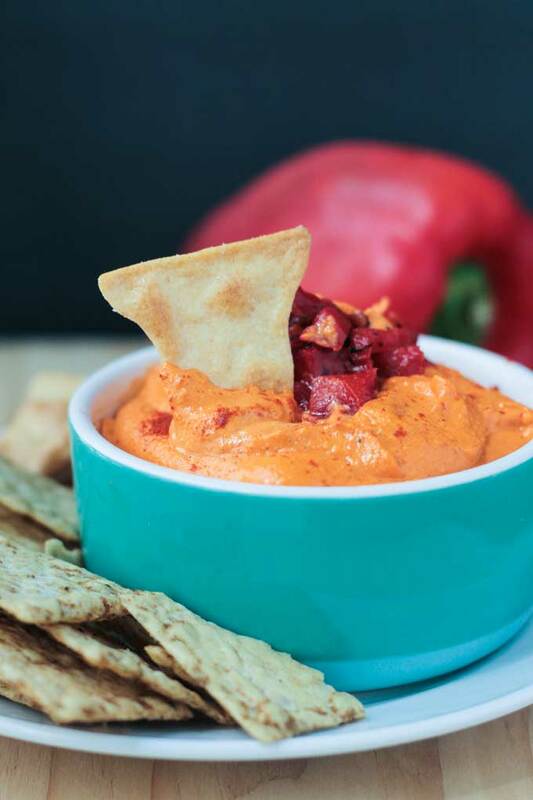 Cashews work their magic again in this Roasted Red Pepper Dip and you don’t need to add any oil or dairy substitutes (like vegan sour cream or vegan cream cheese) like a lot of recipes call for. You will need to soak your cashews for at least 30 minutes in hot water, longer if you have time, to ensure they get nice and creamy and completely pureed in your food processor. I used not one, but two smoky flavors in this cashew dip: smoked paprika and liquid smoke. If you guys have been following my blog for any amount of time, then you are very familiar with smoked paprika. I use it all the time. Now that I think of it, I have quite a few recipes that use liquid smoke as well, like my Smoky Cajun Pasta and my Sloppy Lentil Sandwiches. These two ingredients together give a wonderful earthy, woodsy flavor to the dip. Ok, friends, it’s Friday and I’m ready to get out and do something fun, so I won’t keep you with any more babbling. 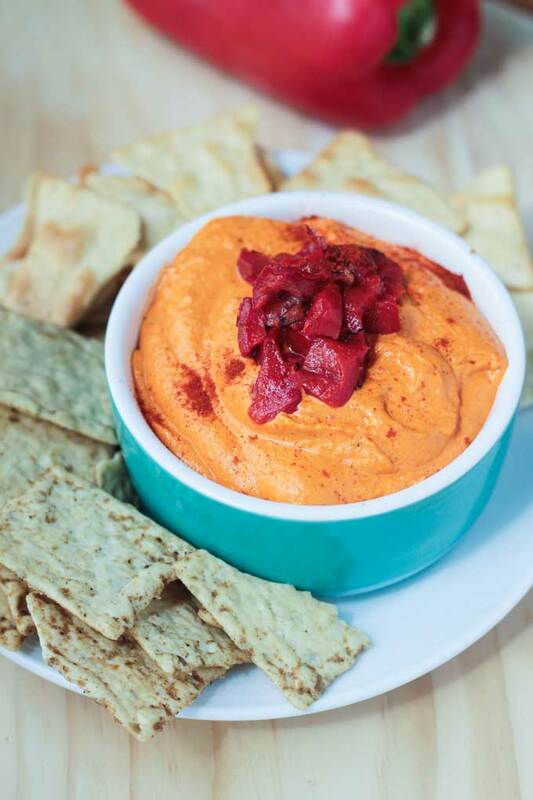 Go make this Smoky Roasted Red Pepper Cashew Dip and use it as a dip for all-the-things! Then come back and leave me feedback below! You can tag me on Twitter and Instagram, too with #veggieinspired and @veggie_inspired. Better yet, snap a picture so I can see your beautiful creations too! 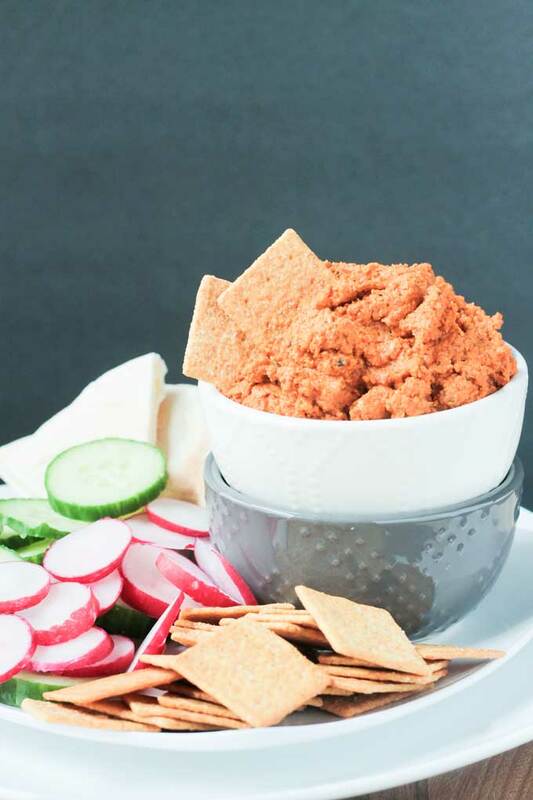 This Smoky Red Pepper Cashew Dip is a little smoky, a lot creamy and very easy. It's perfect for dipping tortilla chips, crackers or even raw veggies. 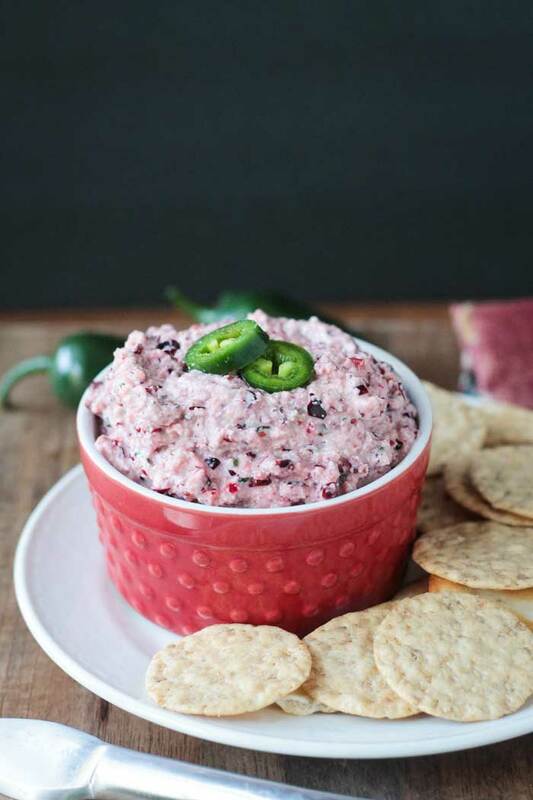 If you like smoky flavors, you will love this dip! Place all ingredients, except water, in a food processor and process until smooth. Add water to thin to desired consistency. Start with 2 tbsp of water and add more 1 tbsp at a time if needed. Serve with chips, crackers or raw veggies. Or use it as a spread for a sandwich or wrap. Love this creamy dip, love that its smoky too! Smoky is my fave! I could eat this whole dip in one sitting. Hopefully, you’ll eat a more normal portion. 🙂 Thanks, Michelle! We made this dip the other night and I’ll be real honest…I didn’t really need anything to dip in it, but I did use some oil-free potato wedges and we even dolloped some on top of our chili! This was sooooooooo good! I had to omit the liquid smoke because Willow isn’t always a fan of smoky things, but it still had a nice smoky flavor thanks to the paprika. We will definitely be making this again…and again! Oh yay!!! I’m so happy that you loved it. Dipping potato wedges in it sounds absolutely divine — GREAT idea! And on chili too…yum! Thank you for making it and leaving your awesome feedback! Yum! A cashew dip sounds so scrumptious! Wonderful recipe, Jenn! All of my favorites in one! Thanks, Sina! Perfect! Dips are so fun! I hope you love it, Hauke!! Please let me know how it turns out! Super creamy! You should definitely get on the cashew dip bandwagon. 🙂 Thanks, Aimee! I too have a very real tortilla chip addiction 🙂 This sounds like the perfect dipping accompaniment! Then you know my struggle – should I eat a meal or just open a bag of tortilla chip? LOL! Thanks, Donna! I would 99% of the time pick the chips with a great dip like this any day and time of the week. It has all you need. My fav. Right now is just a chunky salsa/pico with vegan cheese shredded. I’m not vegan or anything but I like the vegan cheese in the un-melted form like this. Thank you, Theresa! 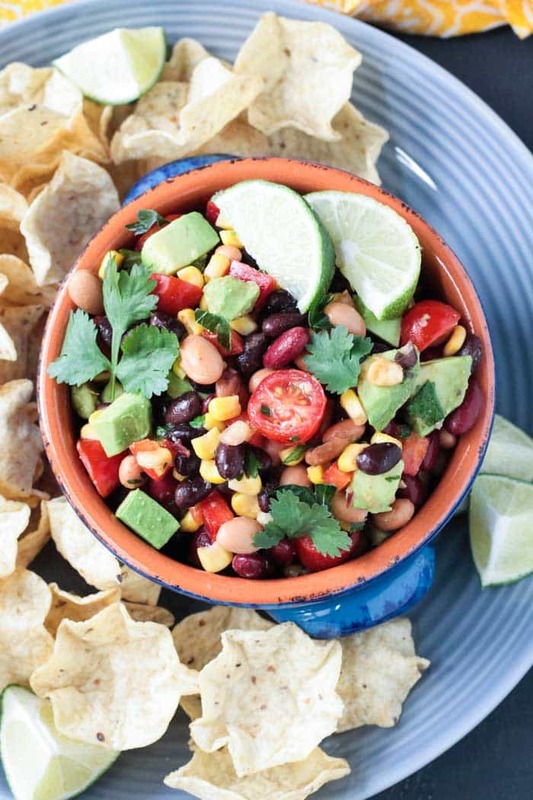 Chunky salsa is the best! I hope you love this! Please come back and let me know how it turns out! Enjoy! I love dips of all kinds! And smoky is such a good flavor. It sounds really indulgent! Dive away, my friend! 🙂 Thank you so much. I hope you love it!! Happy hour is always a good idea, Linda! After 5p or not!! 🙂 Thanks! The weekend is here, what could be better than this dip and some crunchy vegetables to dunk in it. Nice! My ratings system is super glitchy! I’ve had others complain that they can’t really see what they are clicking on either. I need to look into changing it! Thanks, Jac! Weekends are meant for snacking, right? 🙂 All my favorite things! Thanks, Natalie! Oh my…i could go to bed with this…so yum!! And that glorious color. I am eating this off the screen ? Yea, I’m swooning! Smokey, cashews and you even got tahini in there! My magical dip of joy right here!